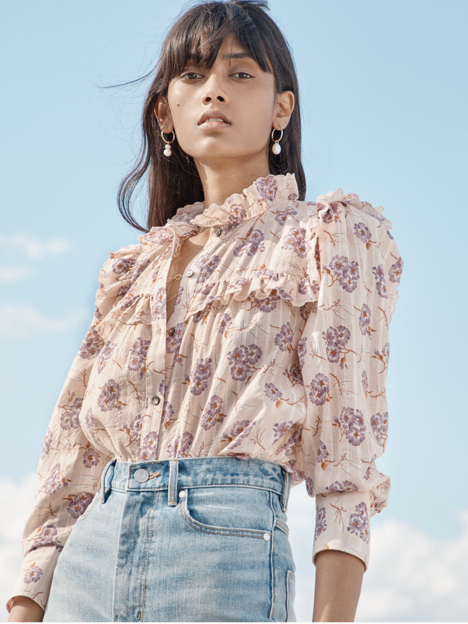 Designed in a bold, artisanal floral print, this three-quarter sleeve cotton top is a staple for the season and beyond. Designed in a bold, artisanal floral print, this three-quarter sleeve cotton top is a staple for the season and beyond. Its pastel rose print is accented with ruffles at the shoulders that delicately frame the face. Let it elevate jeans or mix it up with a statement skirt.